On Friday I managed to catch an incredible documentary: “Under African Skies”. 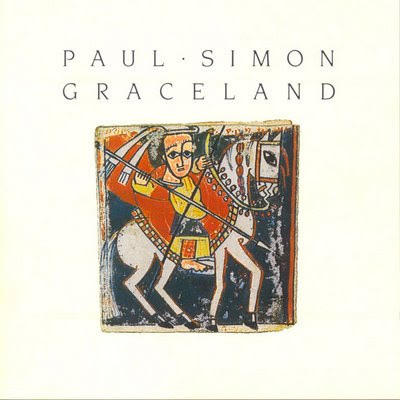 It followed Paul Simon as he journeyed back to South Africa to reunite with the musicians he collaborated with to produce the Graceland album. The film had such an impact on me, bringing me to tears on a number of occasions. This album was very special to me. It came out when I was 10 years old and we had a cassette of it that was played almost until it could play no more. The songs have been a soundtrack for my life. My family have jammed the whole album over the years, me picking up piano accordion for renditions of “You Can Call Me Al”, and playing “Diamonds on the Souls of her Shoes” at my brother’s wedding. It was through Graceland that I first connected to Africa. The rhythms of “Gumboots” and the deep a capella of “Homeless” somehow took me to a place that I had not experienced before. In listening to this music it seemed as if it was part of me. The idea of having a past life in southern Africa is about the only explanation I could find to support the connection I felt. And when I traveled to South Africa for the first time in 2006, it was like going home. When Paul Simon first appeared on Saturday Night Live with Ladysmith Black Mambazo in 1986 and then released the album, the world went crazy. People had very similar responses to me and the album had monumental success worldwide. While mine and others’ experience of Graceland was uplifting, there is also another side to this story. The documentary uncovered a darker side of it, and a bunch of ethical dilemmas that Paul Simon faced throughout this project. A number of them really highlighted the tensions between art and politics. South Africa at the time was still gripped by Apartheid, and with no end in sight. The world had united around an international economic and cultural boycott of South Africa. I have few recollections of news stories from my childhood, and images from South Africa under Apartheid were among them. The horrific reality and darkness of the images really fed the need and urgency for swift and strong political action. This wave of change became a perfect storm, and Paul stepped right into it. Paul Simon’s approach to change was very different. He seemed to mistrust politics at any level or from any side, not even collaborating with the African National Congress to seek their support. For him, this was a matter of art and making music and the idea of skin colour did not come into it. In writing songs for the album, he also avoided politics. While other artists had attempted to make political statements through art, Paul wanted to celebrate life. The songs expressed love, joy and at times very simple themes of village life in South Africa. Not long after the release of the album, public criticism began to be thrown at Paul Simon. He was criticised for being a supporter of the Apartheid regime because he didn’t ‘respect’ the boycotts, and for stealing music from black South Africans, thus perpetuating apartheid. The criticism of Simon still lasts today, and had effects on the tour and him personally over the years. One of the main threads through the documentary was a conversation between Paul Simon and one of his main critics Dali Tambo, leader of “Artists against Apartheid”. Through the conversation they both shared their views and recollections of the time in order to come to some shared understanding. The conversation had multiple layers to it. There was this tension between the idea of whether sharing music versus cultural sanctions being the best way to create change. Even though Tambo was himself an artist, his resolve around the boycott strategy was very strong. Secondly, there was this racial and emotional dimension. Tambo was a black South African whose family had been very active in the African National Congress. Paul was seen as a rich, white man who came from New York to do good, or as he was criticised: to come in and steal South African music. There was a recurring question throughout: who did Paul Simon think he was coming in and messing with this issue? This blog has explored the ideas of involvement vs intervention, and what constitutes ethical changemaking. Without giving away the full magic of how the conversation between Simon and Tambo ended, there was an agreement that despite (or because of) his approach, Paul Simon had done more good than harm. It is something that has taken time to be able to see that. For me there were two forces at play here. Paul Simon seemed to be equal parts artist and warrior. While that term may not have been used by Simon himself, it seemed that he played a sacred role in this perfect storm. The fact that he had such opposition showed to me that he was in fact on the right track. This idea of resistance seems to be a feature of any change that is worth pursuing. While his intent was purely to make good music, the situation landed him directly in the role of artist as changemaker. Simon showed that love and music can be a greater force for change than perhaps we give credit for. While the impacts are not always immediate, the long term cultural impacts of what he did still stand today. The Graceland album showed the world a very beautiful side of the South African culture that was until this point invisible. He provided a platform for South African artists to launch international careers. As a musician, his approach to sampling and cross-cultural collaboration also changed the future of music. Of course it is not a matter of art versus politics. Both approaches were necessary in the transition from Apartheid. Politics and economics shut it down, while art opened it up to what was new. Each came to this knowing what they knew. Some held that their view was the right view, while others allowed each to exist. When Paul was saying “I know what I know” at that time, he was dismissed. How easy is it to dismiss people for simply doing what they know is right and good. Sometimes it can take a long time to really see change, or indeed that what we know may not be the whole story. This blog does not do the documentary justice and leaves a lot of important detail out. If you are interested in this subject or the album, then I encourage you to track it down. Check out the trailer here.